SOCAPA mixes the best of elite film programs and exciting summer camps. Nowhere else will you find this level of filmmaking intensity combined with this much fun. We currently offer six different filmmaking intensives for students ages 13-18. For new students, we recommend the Core Filmmaking Program - our most popular intensive! - or our shorter one week Filmmaking Boot Camp, if your time with us is limited. For return students, we have Advanced Filmmaking and Advanced Projects. 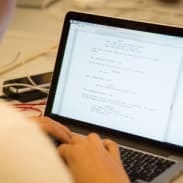 Filmmakers and writers of all levels can also hone their skills in one of our Screenwriting intensives. At the heart of great films are great stories. At SOCAPA, students focus on storytelling. Each student writes, directs and edits their own films, crafting the stories they want to tell from start to finish. Learn to capture picture and sound separately, like the pros! Collaborate with SOCAPA's Acting students, the stars in your films. Crew on one another's films and gain experience on set with other filmmakers. 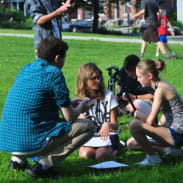 SOCAPA offers six filmmaking intensives for students ages 13-18. For new students we recommend CORE FILMMAKING with workshops ranging in length from two to five weeks - or, if your time with us is limited, our one-week FILMMAKING BOOTCAMP. For return students, we have ADVANCED FILMMAKING with three to six week options, as well as specialized intensives. Beginning and advanced filmmakers alike can also hone their writing skills in our SCREENWRITING intensives. Our special focus intensives are great for students who are looking to learn more about a particular craft or to work on larger form short films. Provides students with the time, structure, feedback, and theory to hone their writing skills with a particular focus on story and character development. Students spend time workshopping and critiquing their own and each others’ work, as well as analyzing films to discover what works and what doesn’t. Join a group of like-minded filmmakers with a single mission - to make the most compelling and polished short film at SOCAPA. While collaborating with classmates on a film, students learn valuable lessons in script workshopping, preproduction, casting and auditions, shot listing and location scouting; technical skills from camera to sound, as well as post-production editing, sound design and color-grading. Contribute your talents to the group! With a focus on advanced writing and producing, the Advanced Projects program instructors work with a small group of students to guide their filmmaking ambitions to reality. Stories are a way for people to connect, to make meaning out of experiences, and to share their own unique view of the world. Tell your stories through your films. Learn to craft a compelling narrative and bring that to life from script to screen. At SOCAPA we believe in providing students with the opportunity to express themselves through the exciting and timeless medium of film. That's why each student has the chance to write, direct, and edit films of their own creation, in addition to working on one another's films in the essential roles of supporting crew. Students are introduced to using a dual system for capturing picture and sound separately, which is the industry standard and allows for a much higher level of control of each element. 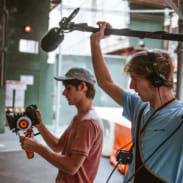 In addition to learning the technical workings of the cameras, students take sound classes and learn the best strategies for recording high quality production audio using handheld audio recorders, a variety of microphones, and production slates. Get ready to mark those scenes and sync that audio! Originally from Rio de Janeiro, Brazil, Miguel Silveira lives and works in NYC. After wrapping his first feature-length documentary I Am a Visitor in Your World (Official selection - Woodstock Film Festival, Thessaloniki Documentary Film Festival, Athens Film + Video Festival) Miguel completed his thesis film at Columbia University, a political thriller titled Devil's Work. The film was selected by Columbia University's festival jury as one of the seven best films to come out of the program in 2014. The film also received the Alfred P. Sloan Foundation production grant, the Caucus Foundation award for excellence in filmmaking, the DGA awards for best film in its category and it was selected as a semi-finalist at the Student Academy Awards competition. Miguel developed and directed the Venezuelan chapter of MTV's documentary series Rebel Music, executive produced by Shepard Fairey, which aired worldwide in 2015. Miguel has taught in institutions such as Columbia College Chicago, EICTV in San Antonio de Los Banos, Cuba as well as Columbia University. He is also a proud sponsor of the Telluride Film Festival City Lights Program. After receiving his MFA from Columbia University, Miguel co-founded NoPort Films and is currently in post-production for the feature film American Thief. Christoph Rainer is an Austrian filmmaker who graduated from The Filmacademy Vienna with a concentration in directing. He then received a Fulbright scholarship to pursue his MFA at Columbia University in New York, where he graduated with honors. His short films have been invited to over 250 film festivals worldwide, screened at museums such as the Tabakelera in San Sebastian and the MoMA in New York and have won numerous awards such as the TIFF Emerging Filmmaker Award at the Toronto Film Festival. Nick earned his MFA in Film from New York University, Tisch School of the Arts. Before entering the world of film, Nick studied literature and theatre at Princeton University and taught English at Chiang Mai University in Thailand. His films have played at Lincoln Center. Nick was the Assistant Director on the 2011 Academy Award-winning short “God of Love.” He is currently developing a dark romantic comedy. Originally from Manhattan, he also spent time, growing up, in Westport, CT.
Levi Abrino is a writer and director based in Los Angeles, CA. Currently, he writes for the animated series Costume Quest, from Amazon and Frederator Studios. Previously, he wrote for Amazon's award-winning series Gortimer Gibbon's Life on Normal Street. And, he helped produce and script the feature film It Had To Be You, starring Cristin Milioti. Levi is a graduate of New York University's Filmmaking MFA program, and his short films "Little Horses," "The Lonely Bliss of the Cannonball Luke," and "I Ran with a Gray Ghost" have screened and won awards at numerous film festivals in the US and abroad. He is also an accomplished editor, notably cutting the Oscar-winning short film "God of Love" and the feature film Lovesick, starring Matt LeBlanc. Erlingur Thoroddsen is an award winning writer and director born and raised in Reykjavík, Iceland. He is a graduate from Columbia University's MFA Film Directing Program. Erlingur’s first feature, CHILD EATER, based on his short film, premiered as the Closing Night film of the Brooklyn Horror Film Festival in 2016. His films have screened at various international festivals such as South By Southwest, Stockholm International Film Festival, Puchon International Film Festival and Screamfest. Jen earned her MFA in Film from Columbia University. She served as Senior Producer for Manning Productions and as Director/Writer/Editor for Sagebrush Productions. Jen is an award Winning Director: Regional Finalist for the Student Academy Awards, Princess Grace Honorarium, two-time Columbia College Chicago Big Screen Finalist, and winner of two Telly awards. Her debut feature film, The Revival, was an Official Selection of Outfest 2017. She is originally from Hot Springs, Arkansas, and remains active in the film industry there. SOCAPA was founded by a culturally and artistically diverse collective of New York City artists and that's the way we run our camps. SOCAPA fosters an accepting and nurturing culture of creativity and collaboration that allows students to be themselves and to express themselves. We invite teen filmmakers from across the country and around the world to collaborate with SOCAPA’s four other programs, learn from other talented young artists, and build lifelong friendships.